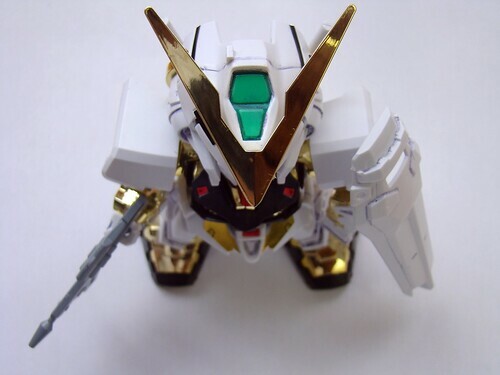 My 10th Gundam figure is the Chibi version of the Gundam Astray Gold Frame, a mobile suit from the Gundam Seed timeline of the ultra popular gundam anime series. 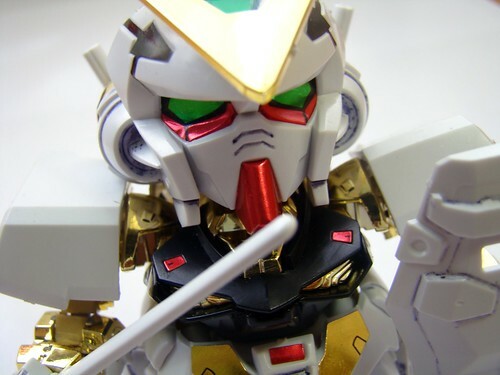 I am 3/4 of the way through the Gundam Seed Destiny anime series but I haven’t seen the Gundam seed series properly yet, just a few random episodes. 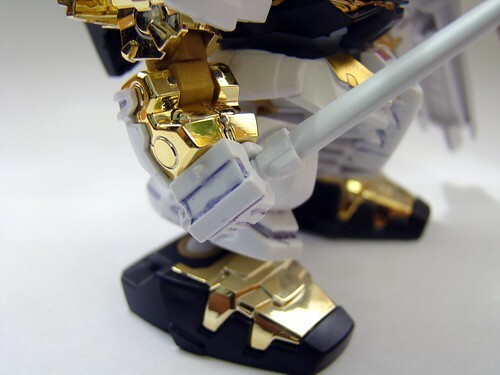 Although I have watched very little of that series the Gundam Astray Gold Frame caught my eye as a design I like and I decided to grab this figure with the possibility of getting a higher quality version in the future. This is my second chibi gundam figure after I acquired Exia many months ago. 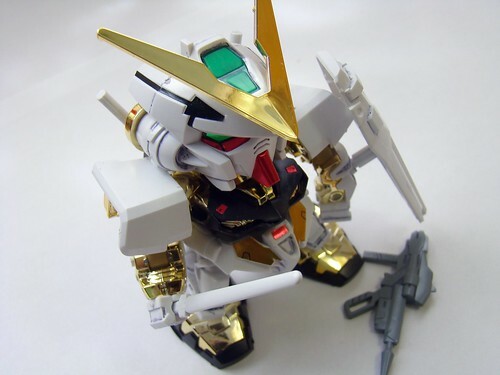 I have developing a liking for Chibi gundam models as their small size and durability makes them easy to take them with you on your geek escapades rather than just having them sit there on a desk or on display. Chibi Exia has been doing a lot of traveling with me over the past few months even joining me on a couple of photo trips all over the place. White probably wasn’t the best colour for the background of these pics and something like the light blue used in the pics of Yoko would have worked better. Since acquiring Yoko though I have decided to give all future models the proper tabletoop photography treatment in my ghetto style photo studio as I wouldn’t want them to get jealous and say I am being biased. Looking back at some of the older pictures though I must say they do look rather crappy but I guess Its good to look back and see what you are coming from and I think my photography of figures have improved over the last couple months. I tried my hand for the first time at detailing a model with a gundam marker set I bought a while back. At first I thought I had messed it up as the marker I used wasn’t a proper one for filing in panel lines which return gives plastic figures a more 3 dimensional look. Looking at the photos now though I must so that it doesn’t look so bad now though but I need to get myself a proper marker for doing panel lines and practice more on doing detailing. 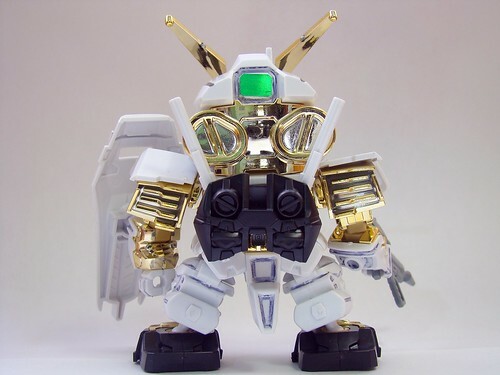 I really love the reflective gold coating some sections of the model which gives it a nice shiny and high quality look. Fingerprints and dust tend to show up easily though so the occasional wipe down will keep Astray’s armor sparkling. The huge head and shield are easily my favourite parts of this model. With my gunpla collection growing nicely I wonder if it’s finally time for one of my chibi figures to boldly explore new terrain and take on the challenges of exploring planet Cubicle. Intelligence has indicated that strange lifeforms called pens, pencils, paper, stapler among others populate the planet which has huge structures named computer, scanner and photocopier that are used to enslave strange bipedal lifeforms called office workers. Stay tuned for future blog posts that will state whether the exploration attempt was successful. hey man, nice shots. and as you say, looking back at the older stuff, you have progressed so far. great work! so shiny.very cool. awesome chibi. 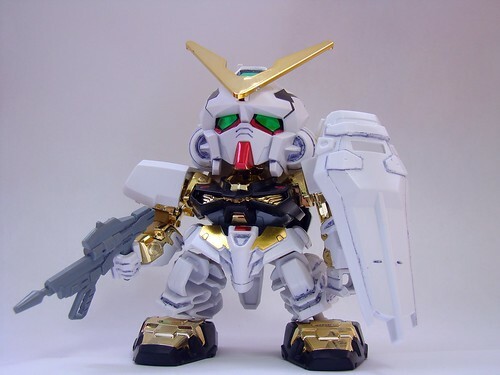 Does the chibi Gundam exhibit symptoms of an inferiority complex when the bigger Gundams are around? But the photos are good, you should put up a post of your photo studio, I don’t have one myself so not sure where to start! my “studio” looks kinda crappy, but gets the job done. I plan on doing a tutorial post on how to shoot good photos of figures once I get some more experience. Would make a great playmate for some Nendos. Well if you have yet to watched “Gundam: Seed” all I can state is halt immediately stop watching “Gundam: Seed Destiny” and watch “Gundam: Seed” first personally I think “Gundam: Seed” is needed to see exactly where the characters are coming from and to see what they are truly capable of a lot of the main characters and fights were toned down in Destiny and it concetrated more on a storyline I think the writer did this because he/she expected that people had already watched “Gundam: Seed” there is one word I can use to describe “Gundam: Seed” and thats “EPIC” in comparison to its sequel “Gundam: Seed Destiny” I think its even illegal to try to compare the two. On to the Chibi now I can’t recall every see this suite in the “Gundam: Seed” Universe but then it was quite a while since I watched it, who was the pilot or pilots of that mobile suite also and also the marker detailing that you were referring to are the bluish linings in the joints of Chibi Astray? What good look’in Goldie you got there . Love the Golden Arm .